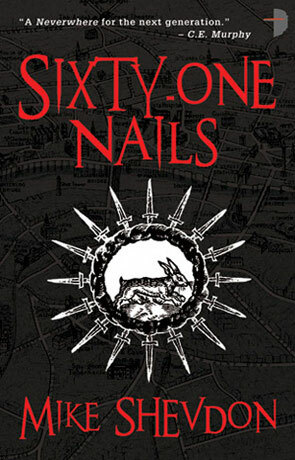 Sixty One Nails is an urban fantasy novel of a secret war raging beneath the streets of London, written by Mike Shevdon. Under the nations capital there is a whole other world where magic is real, the world of the Feyre. A dark magic will be unleashed by the Untained… Unless a new hero can be found. Sixty One Nails follows Niall Petersen who after a suspected heart attack on the London underground, falls into this hidden world that lurks just beyond everyday life. He is saved from death by Blackbird, a Feyre who appears as a sweet elderly lady. It soon becomes apparent though that in the world of the Feyre, looks can be deceiving and by simple magic you can control just how you appear. The Seven Courts rule over the different Feyre cultures that exist without most people ever knowing and Naill quickly finds out he is distantly related to these supernatural beings. The heart attack has unlocked his dormant powers and he must not only deal with a whole new and strange world, but also learn how to control his growing Feyre talents. The Untainted, the darkest of the Seven Courts, have made their play for power, and unless Niall can recreate the ritual of the Sixty-One Nails, their dark dominion will enslave all of the Feyre, and all of humankind too. This book is magnificent in every way, it is an incredible work of fiction that draws you in from the very beginning and holds your undivided attention until the very last page, leaving you with a distinct feeling of loss knowing there are no further words to caress your grey matter. The protagonist is a much more everyday Jo than many writers choose to portray, divorced father of one, with an ex-wife he clearly doesn't get on with, Naill and his life are not perfect and it's these imperfections that ground the story. Combine this some very well researched real world locations and you get a very believable story that you can't help but relate to. Having lived in London for a while, I was impressed with all the little nuances that pervade Sixty One Nails, especially London underground. Mike Shevdon has managed to create a masterpiece of literature that excels in every way and Sixty One Nails is a novel I will remember for a very long time. Other reviews will tell you that it’s an urban fantasy about a guy called Niall Peterson who dies of a heart attack in a London underground station then gets brought back to life by Blackbird. He then discovers a whole new world in the streets and under them... and through them as well. Enough about the plot... buy the book and read it yourself... then read it again. How did it make me feel? I got lost... pure and simple. I left my home and my family far behind, I walked the streets, I ran in fear and watched in awe. I travelled to places I’d never been to before and met people I wanted to know all about. You won’t want the story to end because then you’ll find yourself unceremoniously dumped back into the mundane world of the non-magical. But it will stay with you long after you have finished reading, in the same way as a well enjoyed holiday or a memorable day out stays with you forever. The memories are there to call on when you need a lift and, unlike the holiday, you can always go back and read it again. Unputdownable... you won’t want this new reality to end. Mike Shevdon is a master story-teller, magic in fact. Written on 21st October 2009 by Ant.